Franco. Cage. Robots. Cops. It’s all here, and it’s all boring. My beloved Lionsgate Premiere is back and schlockier than ever! 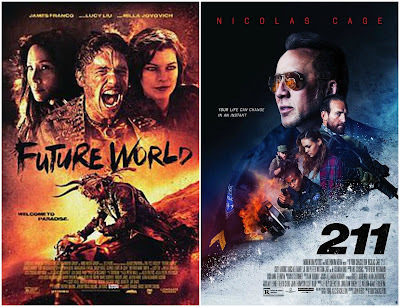 This time, Terminator meets Mad Max in Future World, a movie made by people who are really good at naming things. This is indeed a future world, one in which humanity’s lust for technological supremacy has brought on their destruction at the hands of “synthetics” who no longer wished to be controlled. 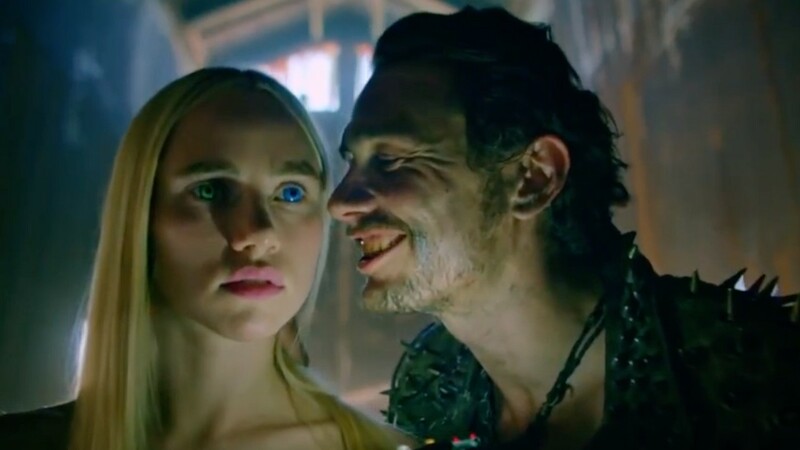 Years later, one of these synthetics — a beautiful blonde named Ash (Suki Waterhouse, who also starred in last year’s post-apocalyptic The Bad Batch) — is awakened by a wasteland Warlord (James Franco) and forced to assist in his dastardly ravaging. But when the young Prince (Jeffrey Wahlberg) crosses their path while searching for a cure for his mother’s (Lucy Liu) illness, Ash decides to overpower her captors and help Prince on his journey. From the neon pleasures of Snoop Dogg’s “Love Town” to the mind-expanding euphoria of Milla Jovovich’s “Drug Town,” Ash and her Prince search for meaning and purpose in a hopeless world, all the while being pursued by Warlord and his nomadic terror squad. There are echoes of better movies all throughout Future World — some more obvious, like Jovovich's (credited simply as “The Drug Lord”) similarities to Lena Headey’s maniacal matriarch Ma-Ma in Dredd, or the synthetic person Ash’s existential quest to love and feel pulled straight from Aliens or Terminator 2: Judgment Day. Others, like the shameless theft of Mad Max: Fury Road’s visual palette or Ash’s ironic similarities to Apple from Turbo Kid (albeit played much differently) take that extra step to find, but they stand out just as clearly once you do. The fact is that there’s absolutely nothing original about Future World, nothing you haven’t seen done better (and, in fairness, worse) in other places. It’s surprising, actually. Ballsy. It’s almost remarkable how little directors Franco and Cheung (the latter a co-writer with Jay Davis) seem to care about standing apart from the crowded post-apocalyptic field, and it’s as if Future World is simply intended to stretch a particular filmmaking muscle and then disappear harmlessly into the ether. Pure and honest rip-off cinema at its most functional, if not its best-executed. Roger Corman would be proud. And it’s that Corman quality that makes Future World watchable. Veterans Franco and Jovovich are having fun hamming it up, while newcomers Wahlberg and Waterhouse are sincere and thoughtful, knowing that any role could be their big break. Copycat, disjointed, and ultimately hollow though it may be, it’s these little qualities that stop Future World from feeling too cynical. It’s a bit jarring to see Franco’s name and face attached to it so soon after the mainstream success of The Disaster Artist, but given the rest of Franco’s directorial work, that movie almost feels like the outlier. Franco is a weird and self-indulgent micro budget filmmaker. He should stay that way between acting jobs. He should follow whims and hone his craft. Very few of his movies work, but in an era (era) defined by nostalgia that fetishizes VHS tapes and synth scores, it feels right to celebrate an honest-to-goodness B-movie like Future World. 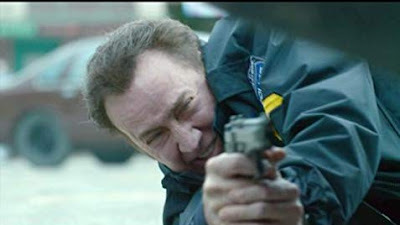 It was while contemplating the virtue of sincere and well-meaning rip-off filmmaking that I moved on to 211, the latest DTV thriller allegedly starring Nicolas Cage. Soulless thousand-yard stare aside, Cage is physically present here as Mike, a cop One Week From Retirement and reflecting on a life spent estranged from his daughter (Sophie Skelton), who’s just announced her pregnancy to her husband — and Mike’s partner — Steve (Dwayne Cameron). As Mike and Steve debate their family’s future, they’re joined on a ride-along by Kenny (Michael Rainey, Jr.), a high school student whose violent outbursts have landed him in hot water. Meanwhile, Interpol Agent Rossi (Alexandra Dinn) tracks a group of ex-Special Forces mercenaries led by Tre (Ori Pfeffer) as they plan a bank heist meant to recoup money owed to them by an Afghanistan War profiteer who stiffed them on a bill. 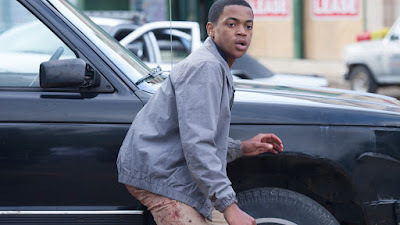 Their plan kicks into action just as Mike and Co. roll by the bank, forcing all parties into a standoff that escalates when Rossi arrives on the scene. All dunking on a guy who writes his own online biographies aside, 211 is a bad movie. The production values are low and the screenplay is uninspired. The acting is — to be charitable — unrefined, with many actors visibly struggling to cover accents and/or remember their lines. They’re photographed at flat angles in shots that linger just a split-second too long, exposing an amateur production to match an amateur script. It’s all par for the course for Cage (star of Redboxing’s The Humanity Bureau, Looking Glass, and Dog Eat Dog) who at least manages to stay one step ahead of Bruce Willis by actually playing a lead role in his DTV efforts. The real question is this: Why does Future World skate by while 211 fails so spectacularly? It’s a matter of subjective taste, to a point, but watching Future World is like watching a world-class chef make a grilled cheese sandwich: It’s a simple recipe, but the bread is fresh and the cheese is flavorful enough to hit the spot. 211 is like watching me burn a steak: I can identify meat and I can identify fire. I know that they can make something great together, but I have absolutely no idea how to make it happen. Everyone just ends up hungry and disappointed. *No relation to 1976’s Westworld sequel. Hola Rob, I'm-a-let-you-finish, but just had to observe that today is the 20th anniversary of The Mask of Zorro, one of the greatest adventure/California history/kinda-sorta comic book-slash-superhero movies OF ALL TIME! Of all time.